It is during my Buddhist days that I was once taken by the concept around Upaya, or “skillful means”. It is defined as any action that guides one towards liberation, an action that, from all texts, was possibly something only for Bodhisattvas and advanced masters to attempt. That didn’t deter me; I was working as a heritage guide at the time, a “glorified storyteller” as a colleague put it, and I enjoyed that role. I addressed large groups of adults and children on a regular basis, but also faced many logistical and timing-related challenges. Skillful means, to me, was getting through a tour without losing my cool and making sure, if my guests were genuinely interested in the tour, that they had a good time; and if they were not, that I managed to tell at least one story that touched them somehow. The tours had good stories, the best ones involving courage or compassion. They were though-provoking and emotionally powerful, borne on an island that has seen much suffering in its relatively short history. On good days, I could move my guests to tears (w00t! score! ), and that happened with some regularity. In the absence of company, we tell ourselves our own stories. This happens naturally, whether we write it out or just replay scenes in our heads. There’s much to be said about how much therapy is about re-writing the experiences we’ve gone through, not to change the details of what happened (although I’ve known people who do this), but to reframe the story within the wider picture, with insight into the other participants, insight into a deeper part of ourselves, and realising that the ultimate ending is still to be. It is through storytelling that we explain to ourselves how we arrived at the here and now, and storytelling that has the power to guide our future steps. Upaya still applies, whether we share our stories with others or not. It applies because it’s as easy to use storytelling for deception (including self-deception) and manipulation, as it is to use for compassion and transformation. Perhaps the difference lies with who is telling the story: the ego, or the heart. While self-explanatory, it needs to be stressed that storytelling is powerful because of its effects. It can be wielded carefully or carelessly, for outward control or inward change. The most dangerous people may be those who are telling stories for the manipulation of others. When control, greed, narcissism, or an extreme want of acceptance are the main motivators, truth can fall by the wayside, and those who have reneged their responsibility to discern and withdraw consent from manipulative narratives can fall prey to deception. Storytelling is as present in religion as it is anywhere else. With every retelling of a tale, parable, or allegory, the story is filtered, and can only be as clear, loving, and powerful as the channel is. (I just got the ping to insert here that this is true of visual storytelling–ie. art–as well. Well thanks. No pressure!) Not to get into the territory of calling all religious/creation stories into question, I want to stress, then, that the voices and stories we listen to should be measured and examined for how they influence us (and we should question our own ego/motives). Never should a story or storyteller be awarded full acceptance from the start and for perpetuity. Neither do we need to demonise or judge someone/something not up to our mark. All of us are human. So a story doesn’t resonate with us for now, or we don’t understand it–move on. It’s silly to place anything on a pedestal forever, and silly again to fight over that. The questions should be personal: Does this story I’ve heard ring true, and on what level–real, symbolic, moral? What does it make me feel and why do I want this feeling, or not? Does it inspire me to become stronger/braver/kinder/happier, or does it make me look for an external savior? Am I more in my head, grasping rationalisations, or in my heart, secure and expansive? Do I want to go hug a puppy right now, or bash someone’s face in? And whose face? Important questions. But we shouldn’t stop listening. It is as much a tragedy to deny stories that we love and that may make us happy, as it is to hold on to one story (or a book of them) past its usefulness. Whatever one’s thoughts on religion, I’ve often found it suspicious that in the mainstream media, we’re presented with simplistic false opposites: You either buy into an organised religion one at a time and wholeheartedly, or you’re an atheist and material-reductionist. To straddle the middle, to be agnostic, or spiritual sans religion, or spiritual via all religions, either earns pity, derision or suspicion. Even within the established religions, there’s further division: Good Christians vs bad Christians. The “real” versus the those Christian/Muslim/Buddhist/Jewish/Hindu “in name only”. When it’s been my experience that those people who are truly good will remain good by finding the stories that inspire them to be so. Same is true for those who want to justify bigoted, selfish, or radical behavior. Stories are not only filtered by the storyteller, but can be filtered by our curiousity, choice, open-mindedness, and understanding. And I believe people have a crisis of faith when the stories they’ve taken strength from in the past no longer serve the new questions in their lives. Consider, perhaps, that if you limit the stories you listen to, and how you understand them, you limit yourself and the sources from which to draw strength and inspiration. I’ve gone through crises of faith. I reached for new stories. I expanded (figuratively and maybe in figure too). If we are to grow, that cycle of crisis-expansion-integration should be a natural and recurring process. So we shouldn’t stop listening and reading. And we shouldn’t stop creating our own stories and understanding as many as we can, on as many levels as we can. And we shouldn’t stop allowing ourselves to believe, when we are drawn to do so, stories of will, courage, compassion, and magic. These stories bring joy despite the grown-up censors we install on ourselves growing up. Kids love magical stories for a reason, and their sense of wonder can be preserved if only we let them know: The magic in real life isn’t absent, just a little different. It’s not on the outside, but within. The scariest monsters aren’t anything outside of us, but inside; and if we can conquer those, then magic anywhere is possible. 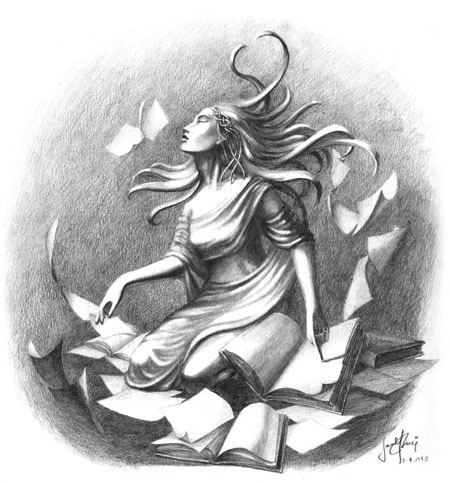 Guardian of the Book: An “ancient” pencil drawing from 1998.